The German trade balance supported EUR yesterday and today ZEW Economic Sentiment Index will be published; however, the trade war still remains the most influential factor for EURUSD. The support rests at 1.17240 with resistance at 1.17720 which both lines are above the weekly pivot point at 1.17010. The EMA of 10 is moving with bullish bias in the ascendant channel and it is above the EMA of 200 and the EMA of 100. The RSI is moving above the 50 level, the Stochastic is moving in low ranges and the MACD line is below the signal line in the negative territory. The ADX is not showing any clear signals. 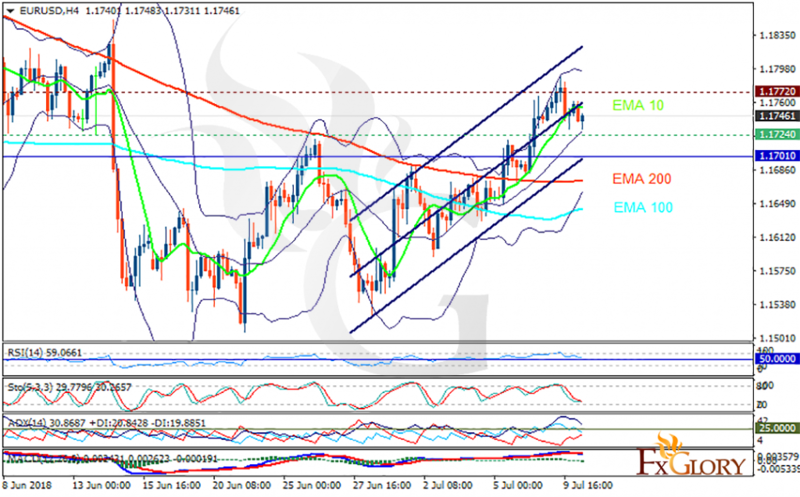 EURUSD will be fluctuating within the lower and upper Bollinger bands.